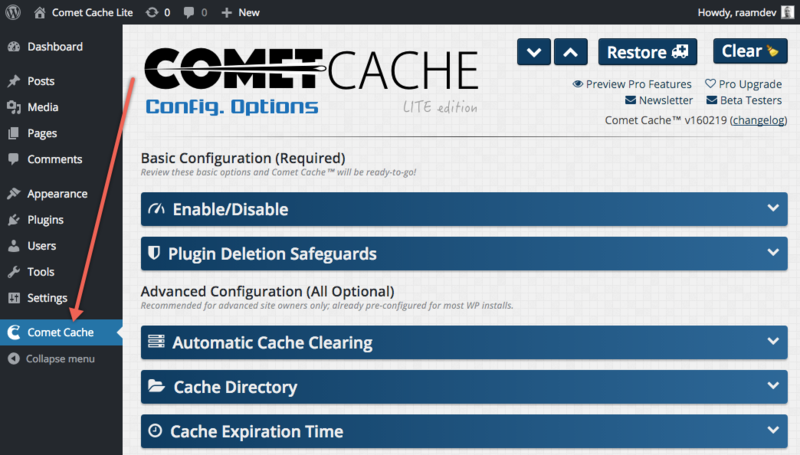 When installing the Comet Cache plugin, Comet Cache will automatically detect and preserve any existing ZenCache settings. Once Comet Cache has been activated, ZenCache will be deactivated. All of this happens automatically; all you need to do is install the Comet Cache plugin. Deactivate ZenCache by logging into your WordPress Dashboard and going to WordPress Dashboard → Plugins. Locate the existing ZenCache plugin in the list and click 'Deactivate'. Visit WordPress Dashboard → Plugins → Add New in the sidebar and then search the Plugin Repository for "Comet Cache". Click the "Install Now" button for the Comet Cache plugin; it should be at the top of the search results. (Optional Step) Now that you've deactivated the ZenCache plugin, you can also Delete it, as there is no need to have both ZenCache and Comet Cache installed. Deactivate the ZenCache plugin and then install Comet Cache. The Comet Cache installation routine will automatically detect ZenCache and then migrate over your ZenCache settings. Please see the full tutorial above under How to Migrate from ZenCache to Comet Cache. Yes. If you had ZenCache installed prior to installing Comet Cache, all of your ZenCache configuration options will be picked-up by Comet Cache automatically. If you have any custom ZenCache settings that you want Comet Cache to import, then you can leave ZenCache installed (but deactivated) until after you install Comet Cache. When Comet Cache is installed, it will look for any existing ZenCache plugin settings and copy those over to Comet Cache. If ZenCache is currently active, deactivate the ZenCache plugin in WordPress Dashboard → Plugins. After you have deactivated ZenCache, you can donwload and install Comet Cache. Comet Cache will automatically detect and preserve your existing ZenCache settings. Once Comet Cache has been activated, ZenCache can be deleted. If the error is preventing you from accessing your WordPress Admin Dashboard, start over from scratch by following these manual uninstallation instructions for both ZenCache and Comet Cache. Once that's done, you can follow the Comet Cache Lite installation instructions. If after following all of the steps above, and reading over each of the FAQs, you find yourself with an issue that requires assistance, please start a new thread on the Comet Cache Community Forum.